Moisture? Flood? Dry Rot? Termites? Timber floor buckles? 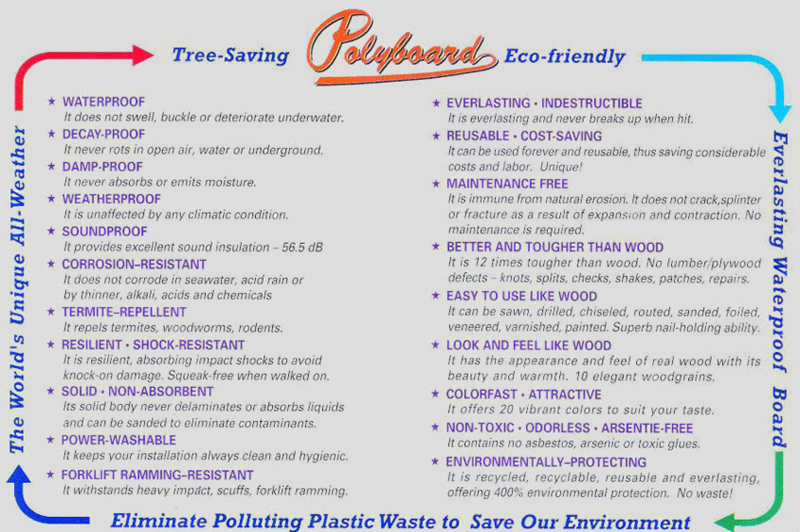 Polyboard is the only proven solution! 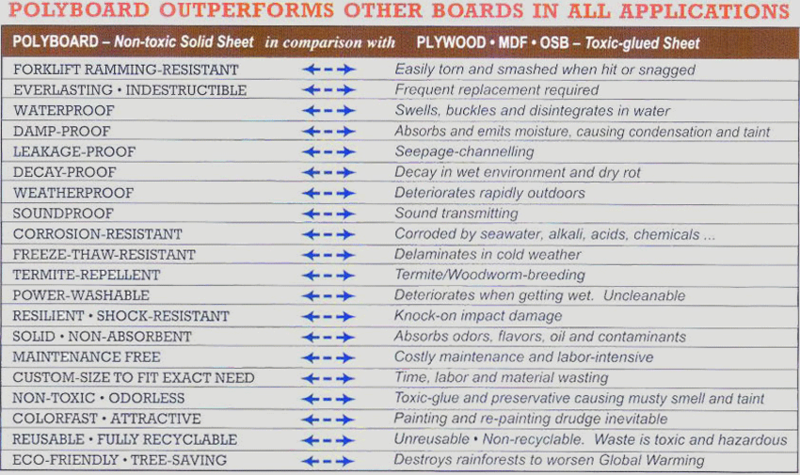 The Manufacturer NCR warrants to the original commercial end-user of Polyboard that the Polyboard will be free from defects in materials or workmanship which result in rot, split, crack, delamination, underwater deterioration, corrosion, damage caused by termites or water leakage through the surface of the Polyboard. This warranty is for the benefit of the original commercial end-user only and is not transferable. Should any of the above mentioned defects appear within ten (10) years from the date of purchase of the Polyboard, NCR shall, upon notification and substantiation that the Polyboard have been properly installed and maintained in accordance with good industry practice, correct such defect by supplying replacement Polyboard without charge or, as its option, by refunding, with respect to any affected Polyboard, the then prevailing selling price charged by NCR to its customers. To report warranty claims please call and give the following information name and address of the purchaser, proof of date of purchase, and a description of the defect. This warranty does not cover defects caused by the effects of damage due to accidents, acts of God, improper installation, unreasonable use, exposure to excessive temperature, misuse, negligence, vandalism or other damage not resulting from defect while in the possession of the customer. Unless NCR elects to repair the affected Polyboard, it shall not be liable for the cost of dismantling, replacing or reinstalling the Polyboard. NCR shall not be held responsible nor shall allowance be made for any work done, items furnished or repairs or replacements made by others unless prior written approval is given by NCR. The foregoing warranty is the sole and exclusive remedy and is in lieu of all other warranties except that of title, whether written, oral or implied, in fact or in law (including any warranty of merchantability or fitness for a particular use or purpose) . Correction of defects in the manner and within the period of time provided above, shall constitute fulfillment of all liabilities of NCR whether based on contract, tort, warranty, strict liability, or other legal theory with respect to the Polyboard. In no event shall NCR be liable in contract, tort, warranty, strict liability, or other legal theory for any punitive, special, indirect, incidental or consequential damages such as, but not limited to, loss of anticipated revenue or profits, loss of use of or increased expense of operation of equipment or structures or cost of capital or loss arising from claims by third parties. The remedies set forth herein are exclusive and the liability of NCR with respect to the Polyboard whether in contract, tort, warranty,strict liability or other legal theory shall not exceed the then prevailing selling price charged to its customers for the affected Polyboard at the time that claim is made.